After a wonderful night’s sleep, we awoke refreshed and given that the forecast hadn’t changed, we called the harbour master to seek permission to move onto the free town quay. 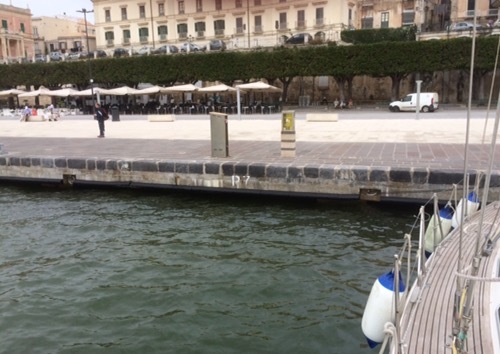 There aren’t any lazy lines so you need to drop your anchor as you motor back towards the quay. All went well although the rings you use to attach the lines are low down on the wall and far apart – think they are designed for super yachts! Just as we were finishing, a tourist boat came in and told us in no uncertain terms that we were in their spot! So, we upped anchor and moved out of their way whilst trying to get hold of the harbourmaster to find out which berth we could move to. As we couldn’t get hold of anyone we decided to chance it and went into P7. Two harbour officials then turned up to inform us that P7 was a double berth and we needed to shift either right or left. To say it wasn’t obvious is an understatement. So, we moved for a third time (upping the anchor again!) and this time they appeared happy. You’d think that P7 was between the two rings but you’d be wrong! When you anchor in the bay you don’t need to present any papers but, apparently, when you use the town quay you do, so we traipsed over to the Guarda Costiera (Coastguard) to present our papers and duly completed form. As it happens we arrived at 3pm just as the office was reopening after lunch but only for the next hour otherwise it would have had to have been at 9am tomorrow. So, all in all, it had taken us the best part of 4 hours to move half a mile! We could stay here for free for up to 5 days but we are probably leaving on Saturday evening for our overnight sail to Roccella Ionica on the sole of Italy. 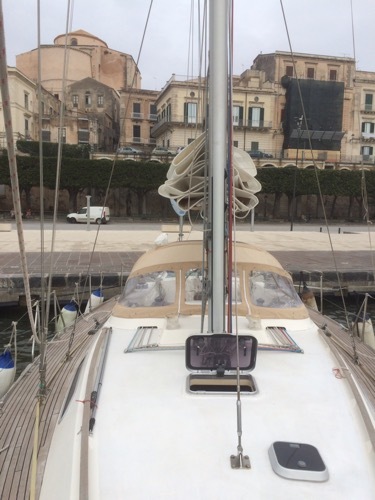 We are now safely moored under the old walls of Ortigia. It has been overcast all day and even rained for an hour or so! This entry was posted in News and tagged 2017, Italy, Med, Sicily. Bookmark the permalink.